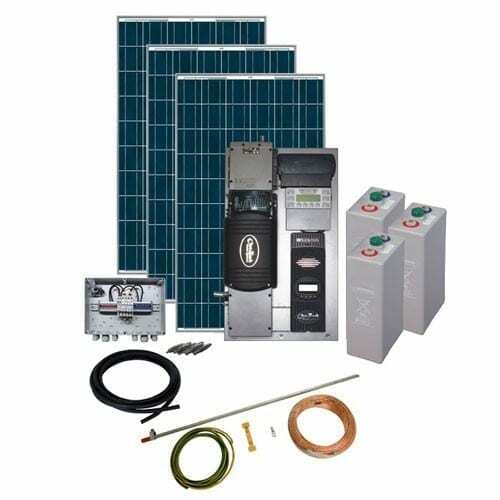 12 modules 260W, 1 solar connection box, 1 Backup Single System, 24 batteries, 1 battery rack, 50m solar cables, 4 Standard 4 connectors, 30m installation cables, 1 lump sum installation material kit. The DIY Energy Generation Kit Solar Rise Four 3Kw 48V off-grid package consists of the following components: 12 modules 260W, 1 solar connection box, 1 Backup Single System, 24 batteries, 1 battery rack, 50m solar cables, 4 Standard 4 connectors, 30m installation cables, 1 lump sum installation material kit. These kits offer a high level of energy independence and are the perfect solution to satisfy bigger energy demands. 230 VAC consumers such as power tools, household machines or all other AC loads can be easily operated due to the Plug and Play configuration. Installation is easy due to the Outback Flex Power systems. Other energy sources like wind turbines, diesel generator sets or even the grid can be connected to the battery to extend the capacity.